Amy of Great Cakes Soap Works Challenge spurred us on to do a combination soap. It is a contest and I had so much fun with the first entry, I did a second one! 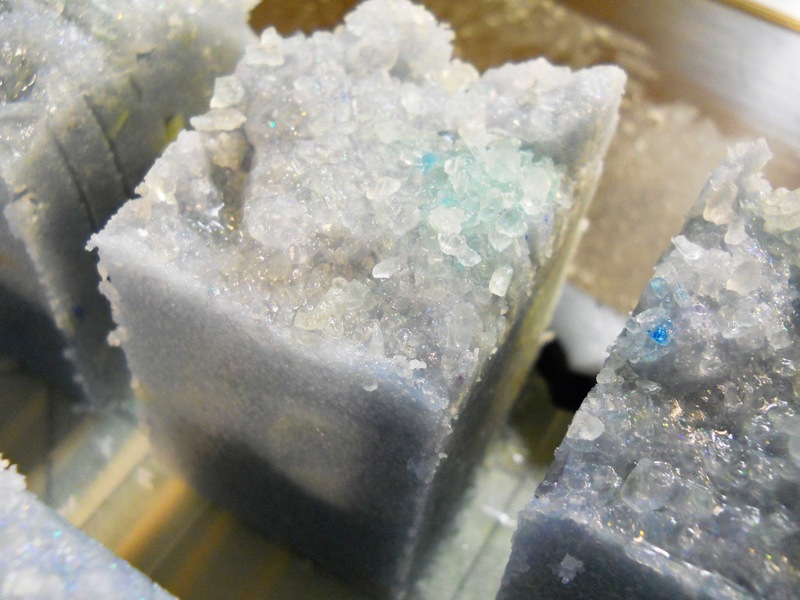 On the curing rack just one more of the cold process soaps with a combination of cold process and melt and pour inclusions. For family and friends just cut Pink Champagne. I don't think I will use the vertical mold again with the dividers. It seems that the soap curing process is delayed in this mold. The top 3X2 inch part of the vertical mold where the soap is exposed to the air just isn't enough surface area I think. 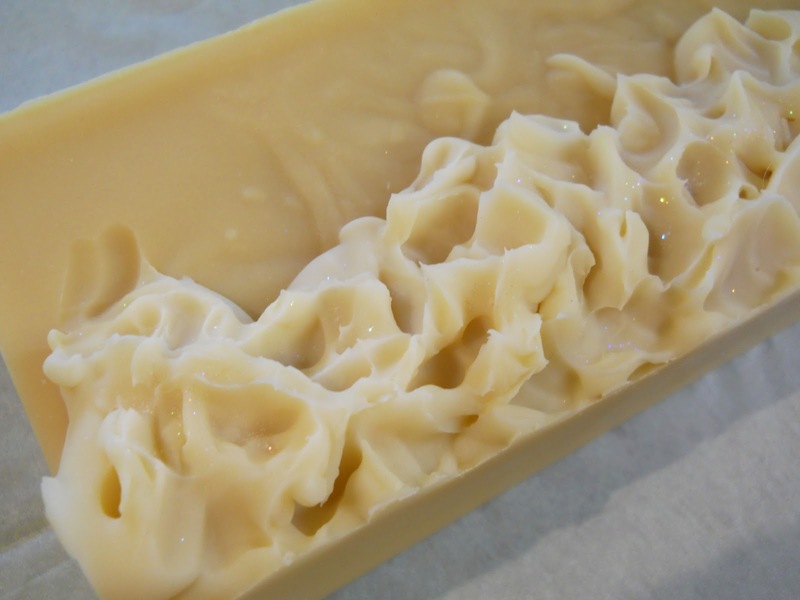 The melt and pour and the cold processed soap after 48 hours is very soft. 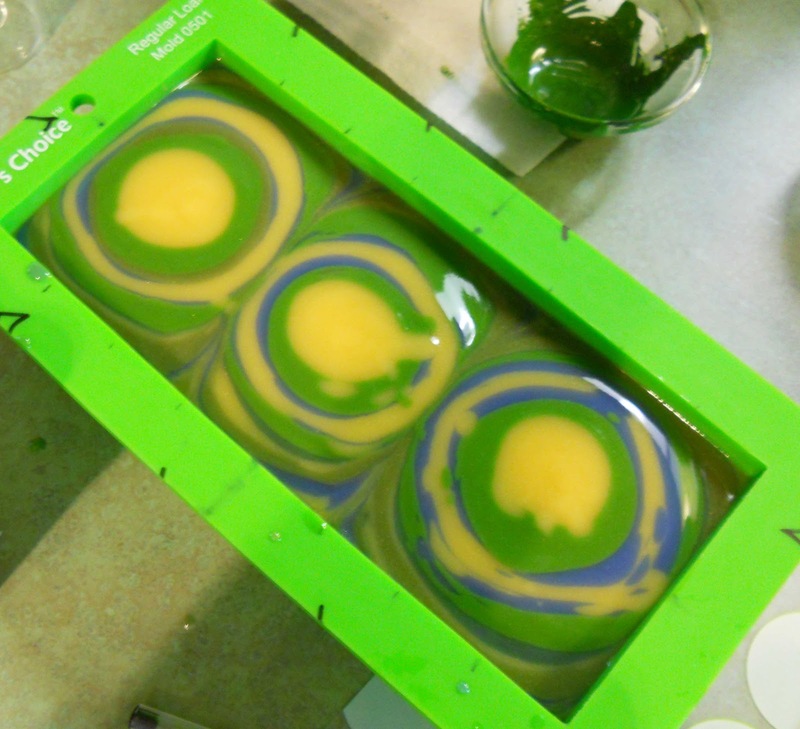 My next use of this mold will be paper lined that is my plan as I enjoy using the mold! So my husband and I did the tubes with melt and pour and cold process about 4 days ago! Needed those extra pouring hands and he was a real champ! We had a time getting the tubes out of the molds but once we figured out how to do the small one, well snap it was easy. Freezer for an hour. Long screwdriver, a 25 cent coin and voila' out came the pink champagne bubbles. 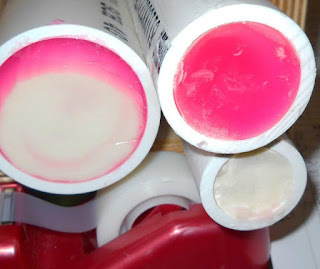 These tubes aired out for a day and then into the vertical mold for a pale pink cold process over pour! 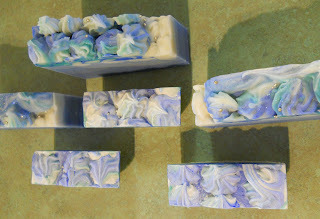 In the final soap I variegated the different size tubes ah bubbles! A bit soft yet but I like the look. I'll let these sit a day or two before I clean them up as they are softer than an open molded soap would be after two days. They smell so effervescent and fresh! In the bottom photo you can see that the melt and pour is still a touch moist but that will change soon! Tomorrow when the sun rises I'm going out with one of these babies. 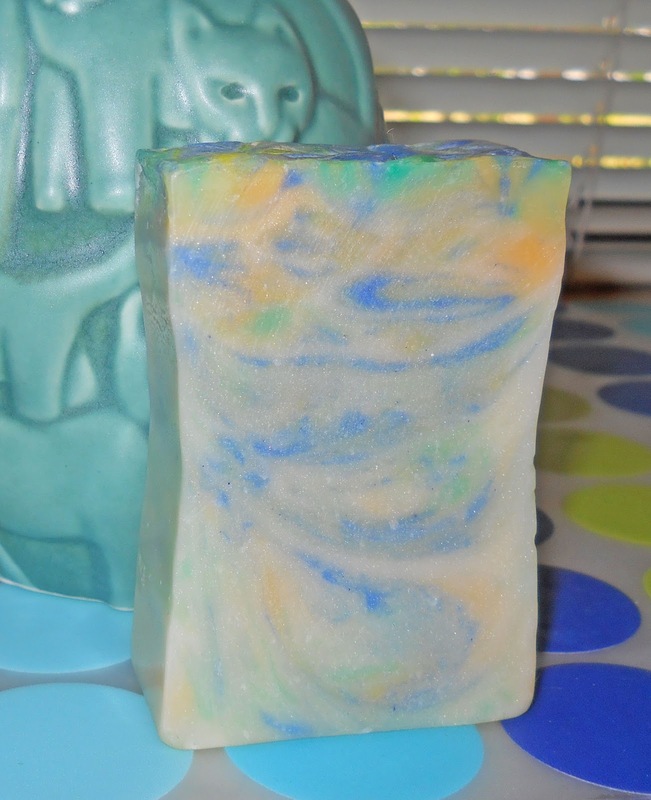 I love how the sun shines thru the soap! This was such a fun project and I've learned a few more tricks to add to my future soaping adventure. Thank you Amy for the nudge! Happy Pink Champagne bubbles for New Years everyone! Oh she is at it again! Amy Warden of Great Cakes Soap Works fame. 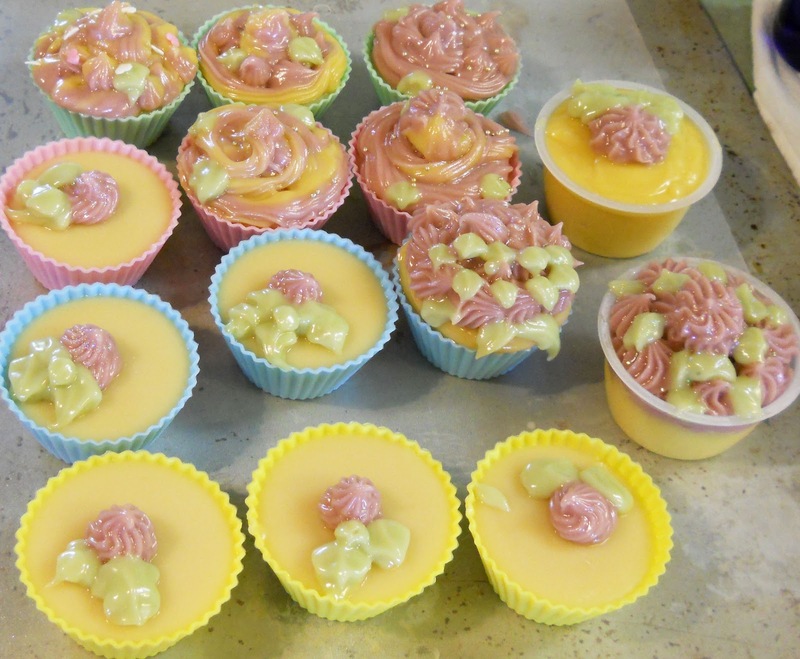 Great Cakes Soap Works has reared up the soap pot and challenged soapmakers to get in the game for another challenge! Amy's imagination and enthusiasm for trying new things had her testing out the Magma Soap kit offered by BrambleberrySoapMakingSupplies and doing a video of her process! 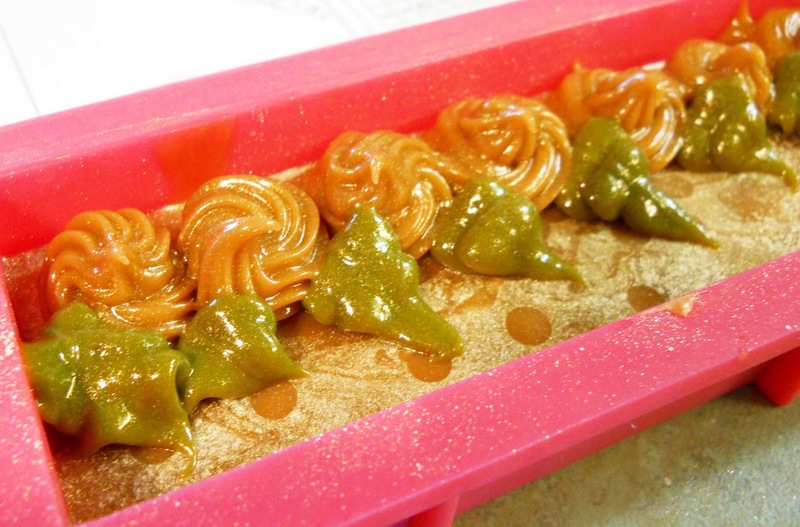 In the video she debuted a 5 pound wooden mold with a silicone liner the prize for the challenge! Seriously drooling over that silicone liner and mold here! 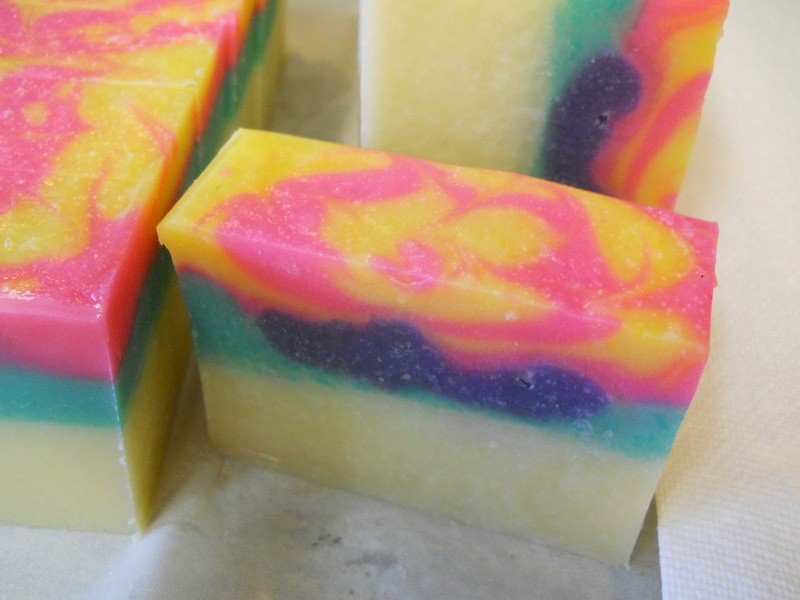 Committing to 5 pounds of an experimental soap is very brave! 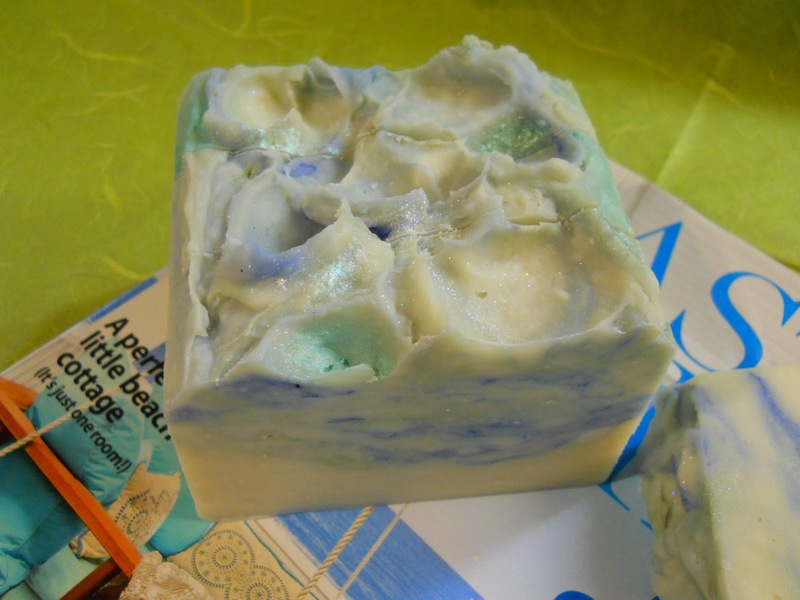 The challenge was to combine a cold processed soap with a melt and pour glycerine soap. I must thank Amy for this challenge! 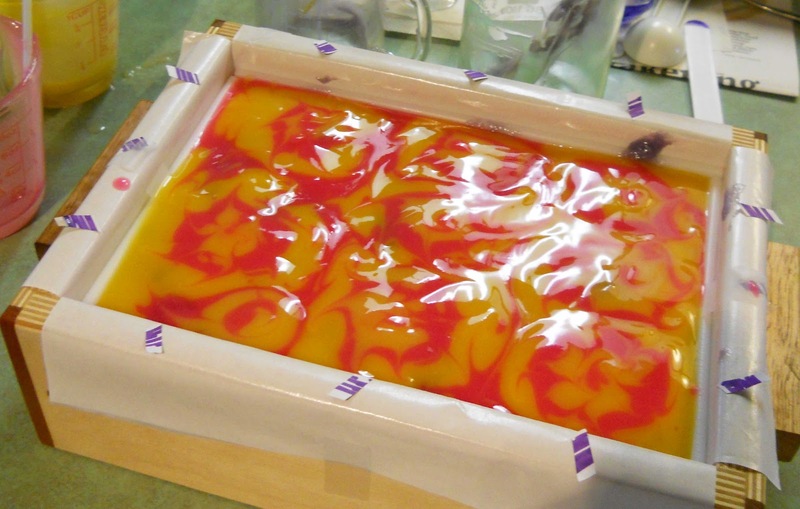 The combination of cold process with melt and pour has been done many times by many soapmakers. Here is one I did for The NOVA Studio Swap of 2011. Such fun to do and THEN I promptly forgot about the combo technique! A year later and revisiting the process of mixing the cold process with the melt and pour I have two new ideas to try! Amy thank you so much for stirring my imagination. You have helped me decide what to do with a touchy fragrance that I have 5 pounds of! Heh heh! Yes my favorite the apothecary coriander! It riced and seized in cold process soap so I've been using it in room sprays and solid perfumes! Now I can use it in combo soaps! Thank you so much! 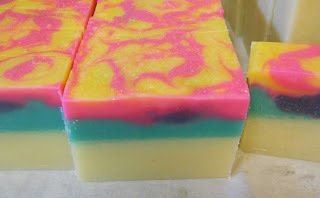 My plan was to do a white soap of one fragrance, boring I know, and combine it with two different colors of melt and pour glycerin soap of another scent! 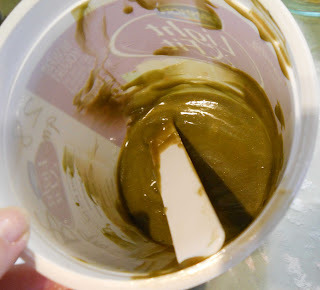 To add a hanger swirl I put the hanger in the empty loaf and after the pour I tried the swirl. Well some success but as I did the linear pour there were a few solid spots that I pulled out of the mold! 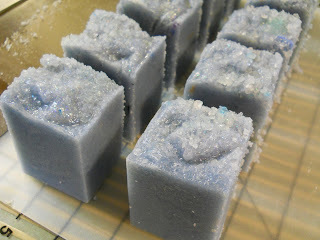 I used my favorite persnickety fragrance in the glycerin part of the process and made two colors of glycerin. My color contrast is pretty in the final soap but next time I will make the two colors a bit more contrasting. The white batter was fragranced with another scent that was very complimentary. OH is it yummy and fit for a luxury out door shower in Hawaii or Tahiti! 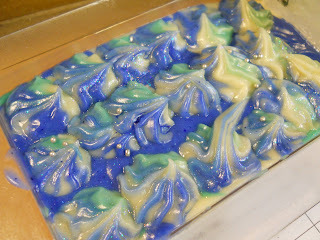 A few photos for you of Sea Foam, Mermaid Elixir or Tide Pool hum! 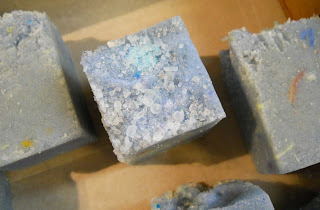 The first photo shows bubbles, left middle, that happened when I poured the glycerin from high. Cool effect! The fragrance is magnifique and I wish this were a 5 pound batch! Now I know what to do with the troubled fragrances! Happy combo discoveries to everyone! Aloha! Has it been a month since the GreatCakesSoapWorks Challenges of 2012? For a link to the goings on check here ! Once again Amy thank you! 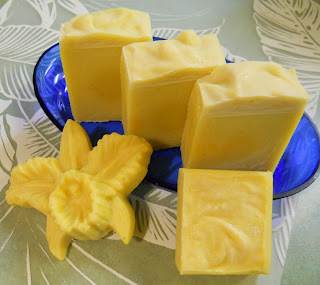 We are showing off our swap sisters soap we shared with one another. 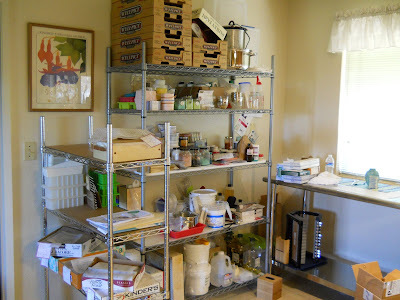 How does time fly while making soap or cleaning cupboards! I actually miss the challenges and look forward to the next round. Seems my organization skills are sharper when challenged, shoved, and or pushed just like most people! My summer markets are going full swing and well so am I like a monkey swinging from limb to limb. This is my first summer at two markets. I am in awe of people who accomplish outdoor marketing and have a life! A woman named Magic is my inspiration! Summer here has been glorious and for that I am so grateful. Nary a day over 100 degrees yet and pinch me this is July! Must be the sun spots gave us a mild June and July. I hope your summer is as pleasant and you are enjoying it to the fullest! Well of course I spoke too soon today triple digits as well as the remainder of the week. It was so nice while the mild temps lasted. 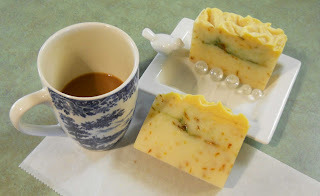 During the Amy SOAP CHALLENGES of GreatCakesSoapWorks fame this spring, many of the participants did a mini soap swap trading one or two of their creations with a partner. I asked to be matched with one of two different soapers Bella Fresca and/or Santa Barbara Soap. Me, well I thought Bella Fresca was in Europe, boy was I wrong just looked them up! They are neighbors! 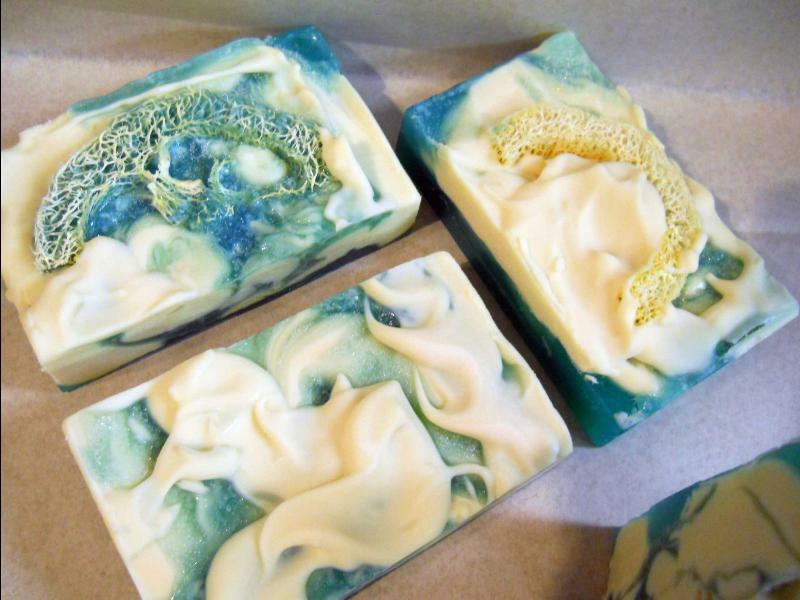 We are now sharing photos of the soap we received. 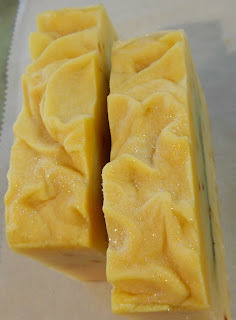 Here is the soap I received from Santa Barbara Soap. 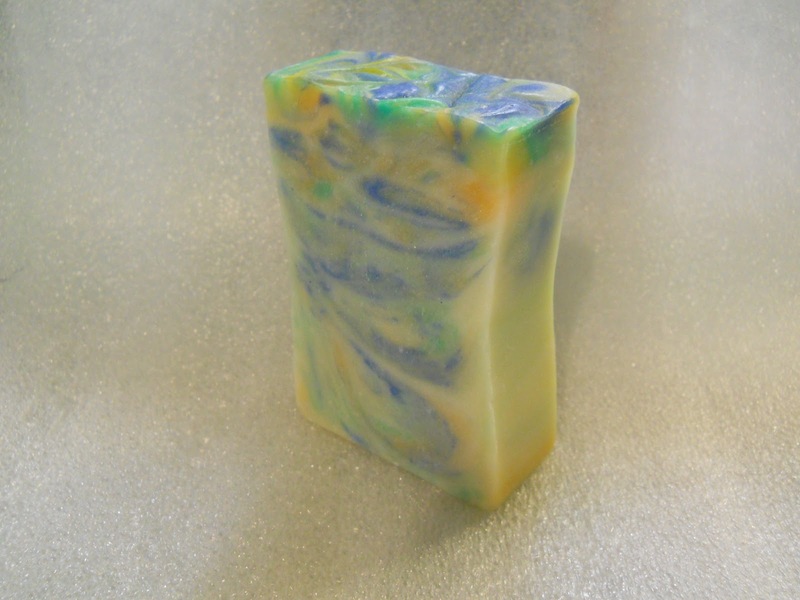 This is called Blissed Out Soap a lemon grass citrus blend light and clean. One which I enjoy. It has already been un-wrapped and used but it still photographs well. Thank you Tracy! 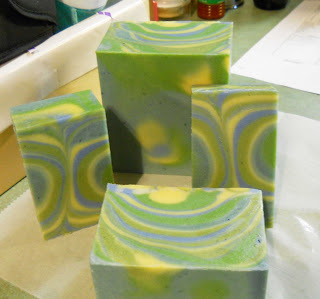 In addition to the color choices I think she has a wonderful idea about the shape of her soaps. 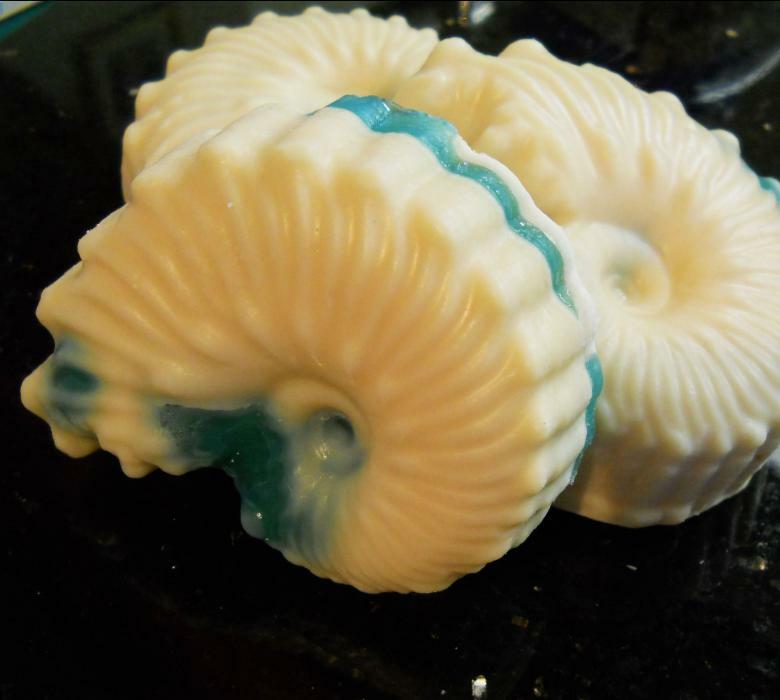 They are rather curved/carved in the middle, more slender in the middle where you would hold a soap. 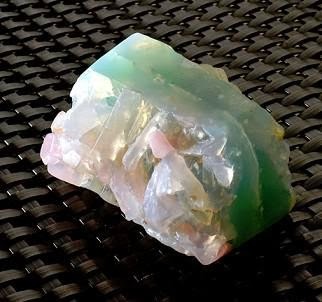 She makes lovely salt soaps from what I could see on her FB. 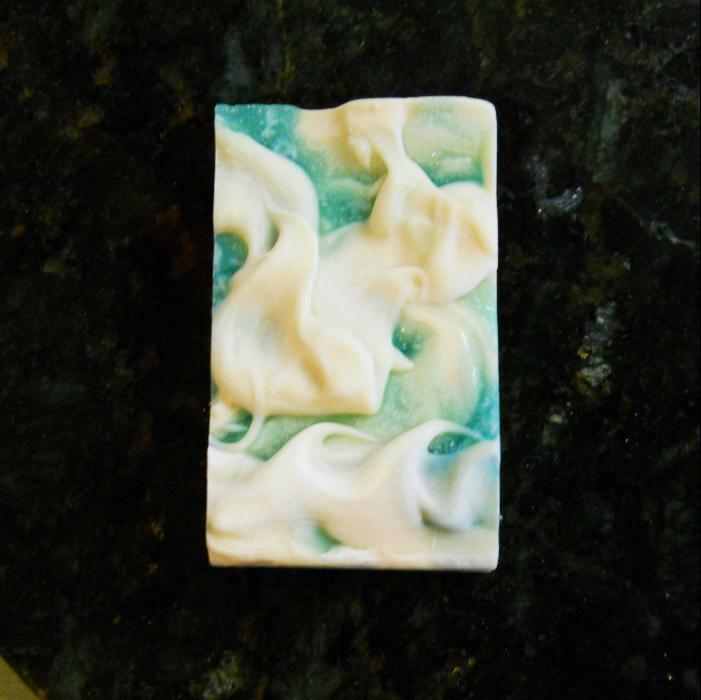 Here is the carved soap Tracy of Santa Barbara Soap shared with me. Apricot, blue, aqua and white! 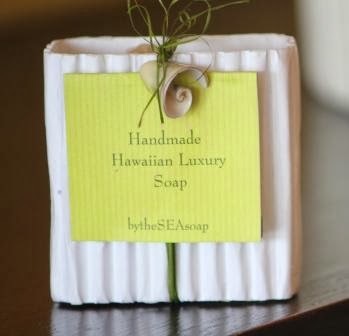 Here is a link to youtube channel 805soap I just received of another Santa Barbara soaper. This video was done for the initial ITP swirl challenge. Her market video is beautiful too and many of her soaps can be seen. Another ITP Swirl 4 Colors for Amy's challenge and videoed! 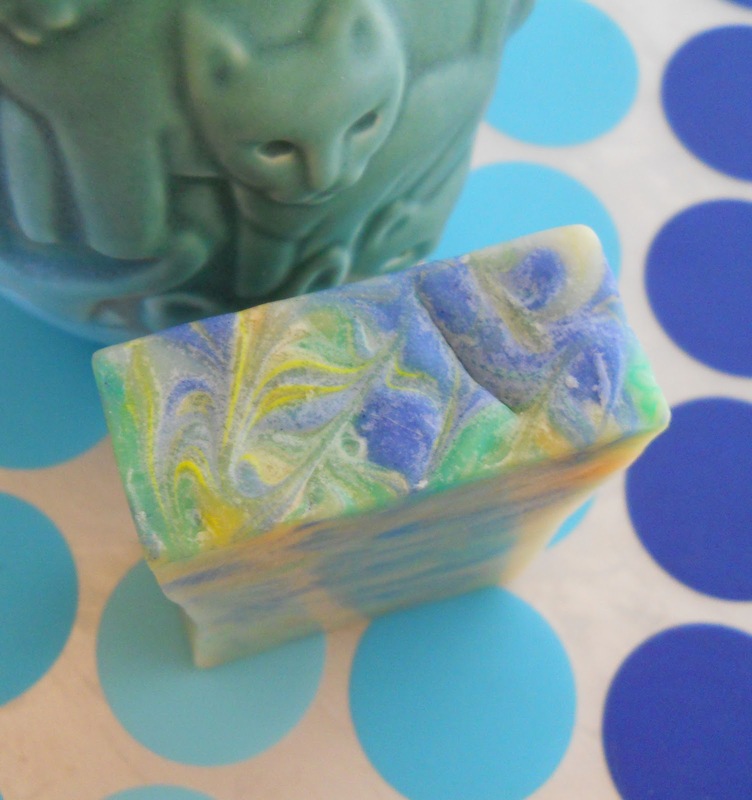 Love these the colors of summer all in one bar! So a third SOCal soaper and I personally know many others. It's a sisterhood I'm sure! Oh sorry a little AD&D there. I think this is the one I sent to Tracy. More summer colors! Happy summer everyone and stay safe and clean! Oh joy and the other delights of experimentation. Keeps your mind flexible whatever the subject, product, activity! As a fellow soaper says " A Mistake is so much fun, You just have to do it again"! This weeks Internationale Soaping Challenge # 6 has been a challenge. My first try was so successful in many ways that I just had to push my luck and go for a second! 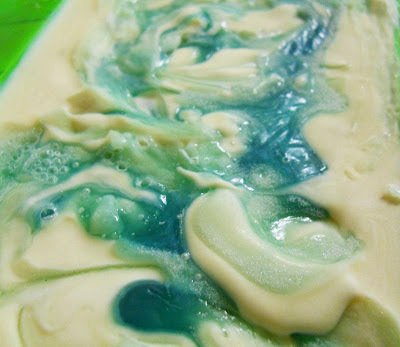 Called the faux funnel swirl technique using colors and circles of soap to design with. Cutting techniques can also come into play with this challenge. 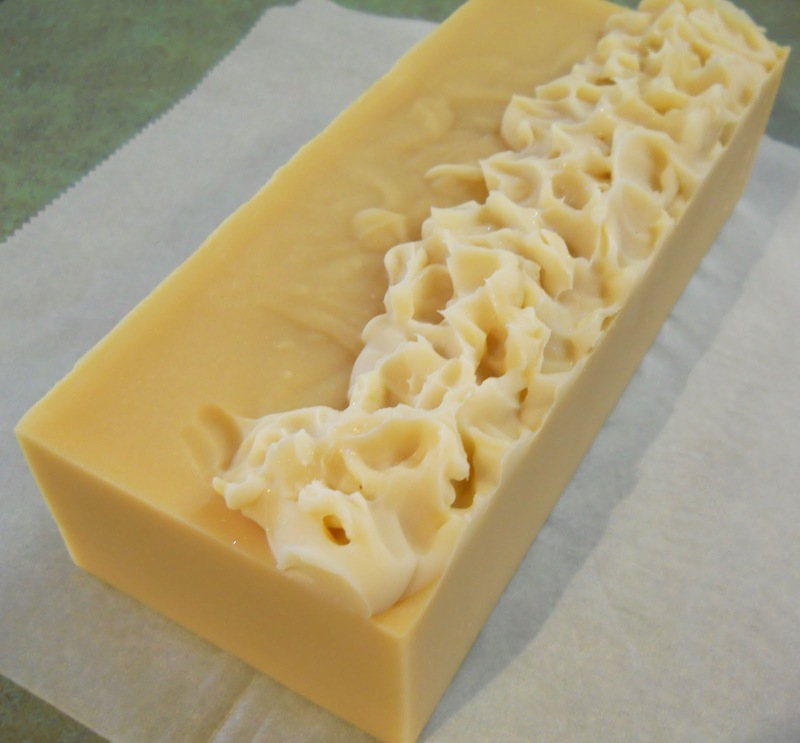 The hostess of these fun soaping design and ingredient challenges is Amy @ Great Cakes Soap Works whose soap can be found here . Amy has been a tireless hostess for the soap challenges and currently 93 soapers from around the world are involved on one level or another. She has even arranged a soap swap for those of the group who are interested in that activity. Go Amy and thank you so much for all the inspiration! This challenge will live on in infamy I think! As I'm always one holiday, celebration day behind what is current for some reason, here is my Earth Day soap one week delayed and not yet cured! Heh heh. OK start with a color a soap recipe and a fragrance, hopefully one that doesn't travel too fast. Well my favorite colors are blues and greens! So that was the easy part the planning the beginning. Ah but to add 5colors well that was a challenge. I had two blues, one clear and one grayed and three greens (but only added two), and for a contrast the yellow. The fragrance I chose was Energy, like solar? 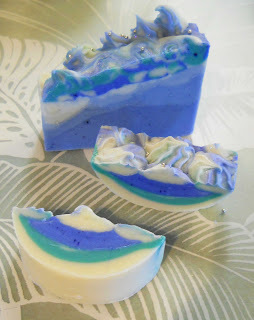 The name of this soap was definitely an after thought, like after I cut the soap and saw it looked like distant photos of the earth from space! LOL a fertile imagination is a necessity here! 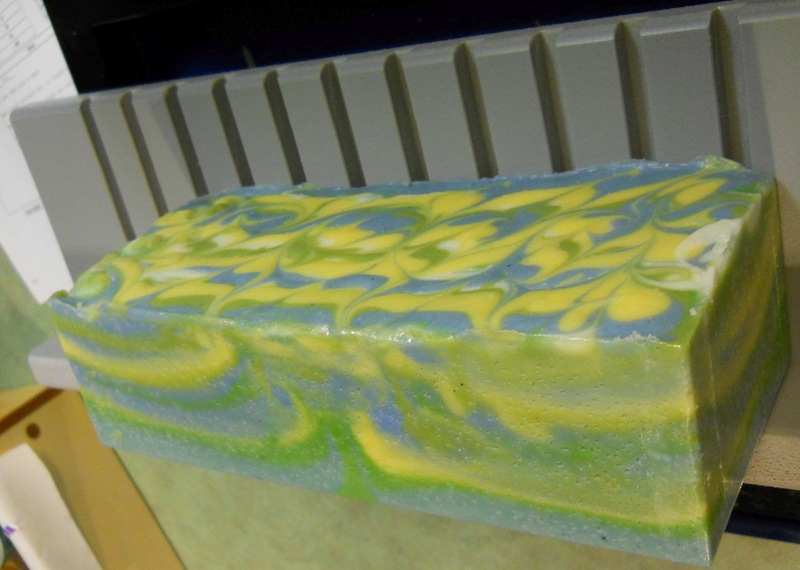 So now you know why I call this Earth Day soap which includes the solar "Energy Fragrance Oil" which is such a lovely bright citrus. 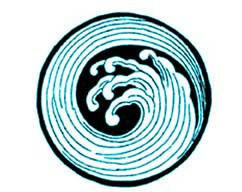 NAME this soap and sure there will be a prize for the winner whose name is chosen and the runner up! The drawing will be May 16th after a trip to Portland! Hope to see you there too! Here is my second FAUX FUNNEL SWIRL soap for week # 6 Great Cakes Soap Works challenge. I like this type of design. It was such fun albeit it messy with so many color bowls! I wanted summer colors this time and an opportunity to use my new pink! I chose a yellow, electric bubble gum pink ( oh boy! 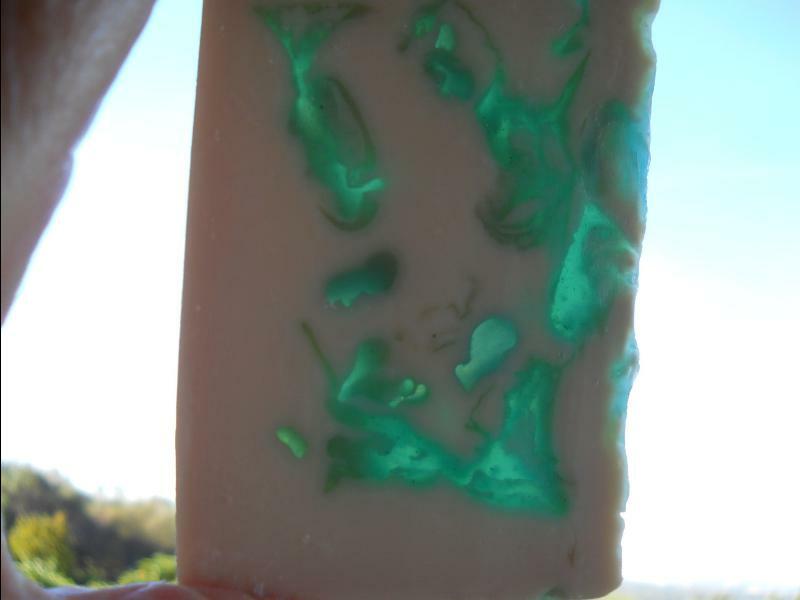 and it glows in the dark-neon) a teal type color with a lavender thrown in. Ok over the top but if you are doing it might as make it memorable! Well this soap wasn't as successful as I had hoped but hope springs eternal and it all worked out well in the end! 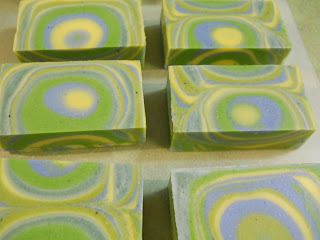 The soap technique and the fragrance ( a tropical floral of course) well didn't agree with each other so here is the improvisation of the original design! Not to despair as the colors and the fragrance are just so wonderful together for summer! Do these colors look like a Grecian beach to you? 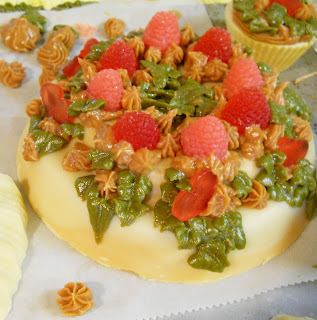 This Bramble Berry Birch Mold is a favorite especially for the new techniques I'm working on! Now it just needs some time and a name! 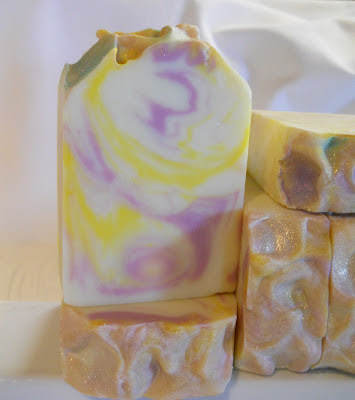 It seems as I worked up the colors separately I need to add the fragrance separately also. So that was a new process. OOPS first bottom 3 layers set up quite quickly. 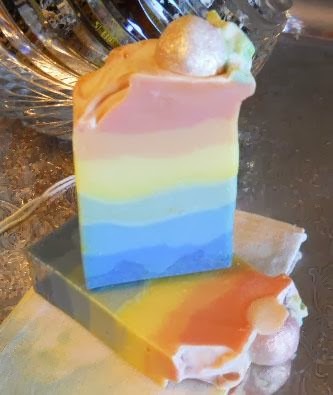 OK I poured the bottom layer alla Anita's LaLaLand soaping technique for beautiful flowers and friendship soaps! Thank you Anita! In went a stiff layer of the base soap but the beautiful teal and lavender pour wouldn't penetrate the base color, oh NO! Hurry, think quick, the teal poured out in a smooth layer but by the time I got to the lavender/purple I had to spoon it in and clump a lump it! Now for the pink and yellow well no fragrance there, I'm learning! Did a touch of pooling and swizzle sticking but that was the whole of it. The bottom layers were too set up for me to do inserts for these bars. That turned out to be just fine as I cut the entire slab by hand and didn't get too crooked this time. Practice makes the job not so intimidating with each new attempt! 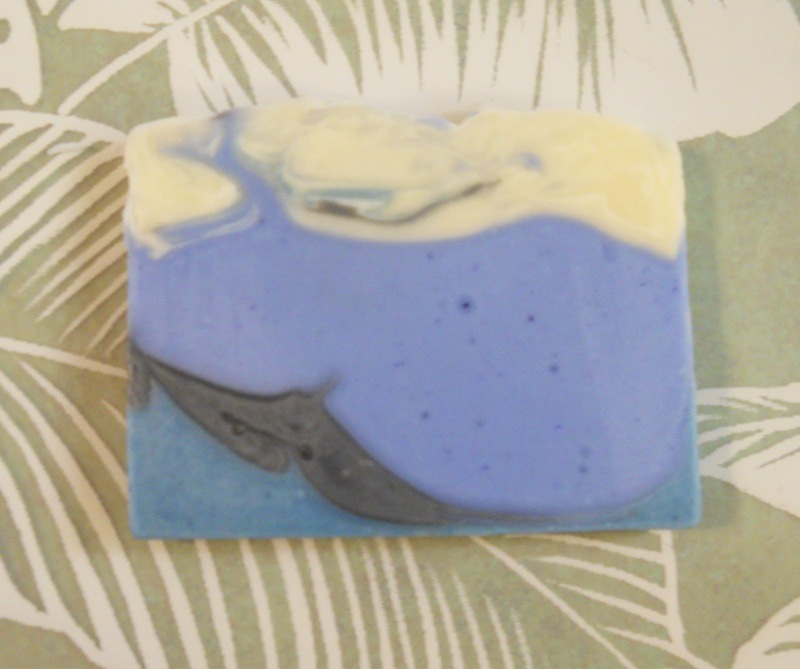 Into the oven for a bit and well here you have a soap that reminds me of a beach in Capri! Sometimes the good the bad and the lumpy work out just fine, and that is a good thing. 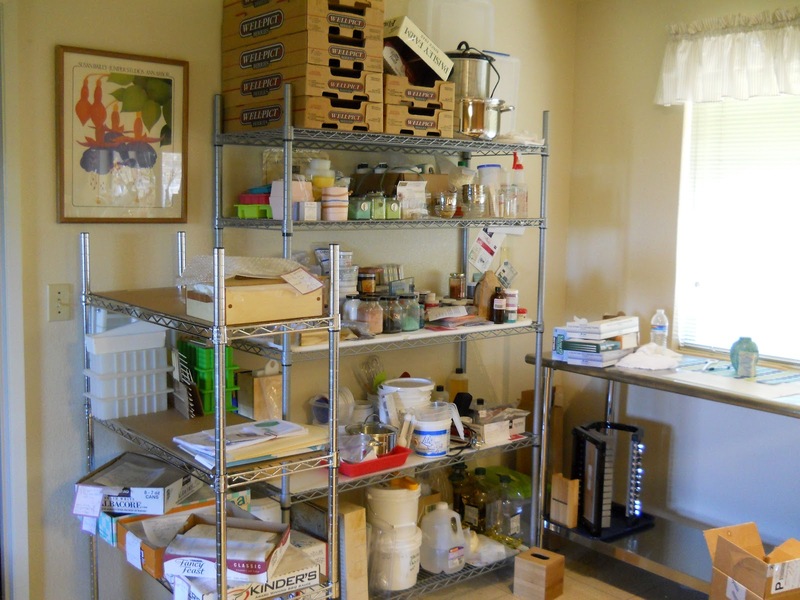 So ends this weeks tales of "The adventures of a frantic soap maker"! Adieu! Good Sunday morning! The sun is shining the birds are chirping and the bees are a hummin all around. Even the hummers are out early today. My garden inspires my new adventures in blending fragrances! I had guests yesterday and it was their first visit to our home. They are city people and were so intrigued with the scent of the air as they walked up the path to the house. We did a tour of the yard. The Cecil Breunner Roses just beginning their bloom, it is a baby pink rose climber. To our guests amazement we still have some of the grapefruit, oranges and lemons left from the harvest and the gorgeous new orange blossoms just emerging! Oh lovely the "garden smells of gardenias"! Gardenias are on THE list for next fall! 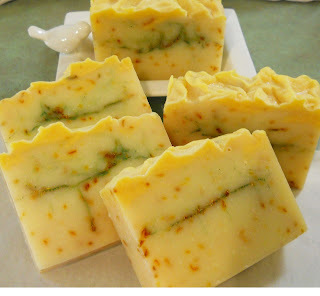 The combination of of roses, rosemary, aloe and orange blossoms. Smells almost like gardenias. It smells of heaven to me, I'm positive, right here in the orange groves with the bees joining in the choir of the yard humming their life saving tunes. 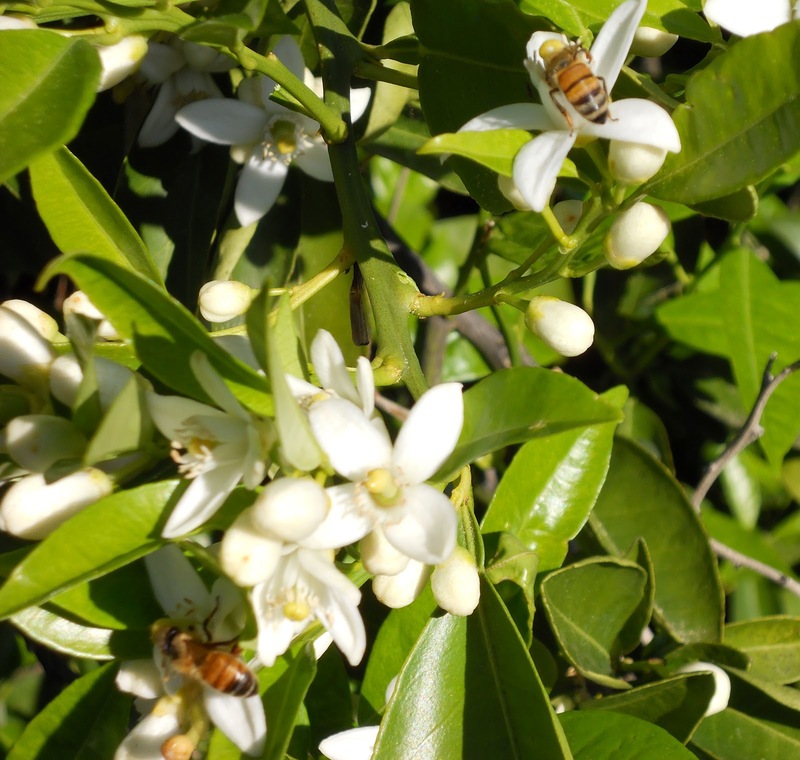 It is ironic that oranges are actually self pollinating but don't tell the sweet bees this. They are loving every breath of the orange blossoms loaded and burdened with golden pollen as they head back to their queen their home. My favorite time of year for morning garden wandering is right now! Not to hot not to cold, just right for a bathrobe tour! 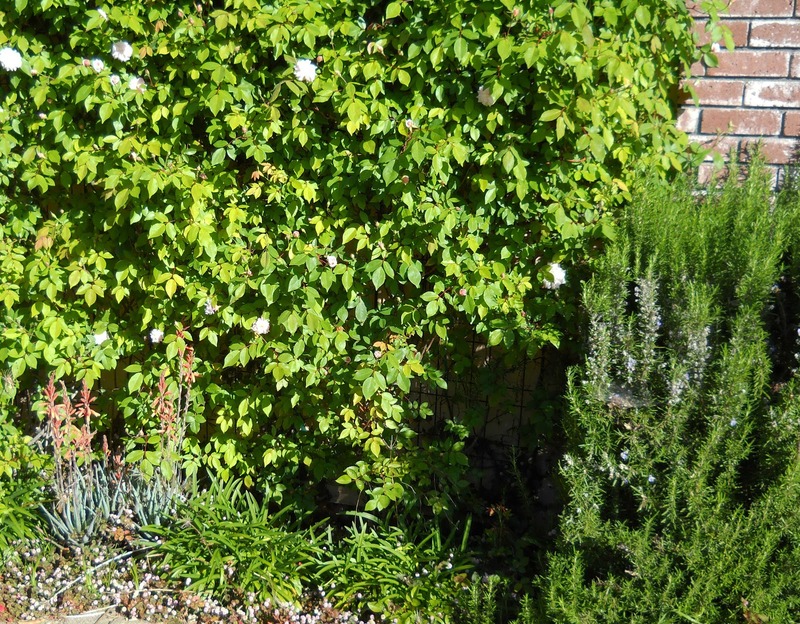 Grab a cup a, and head to the garden with a a camera too! This inspired my Gardener's Sunrise Soap for the 5th Week Challenge. Many thank yous to Amy at the GreatCakesSoapWorks! Check her blog for all the beautiful creations that Amy's blog and challenges have produced here . A few photos of this new to me fragrance and essential oil blended soap. Originally I was going to call it Maui Sunrise, but changed it this morning following my garden tour to Gardeners Sunrise. It has grated lemon and orange peels for exfoliation, some is added to the entire batch and some is layed in a pencil line with a touch og green and orange mica's also. The fragrance is a combination of Orange Grove, appropriate sweet and Litsea bright and lemon, with a touch of plumaria to go! My next batch will be rose to replace the plumaria! The blend Orange Grove 2.5 parts, Plumaria .5 and Litsea .25. YUM. It smells so nice we will have to see when it cures how it holds. I love it and here are a few photos to share. Baby Roses, Aloe in Bloom the left bottom orange blossoms and the end of the rosemary bloom on the right! Thank you and a shout out ( I never thought I would use that descriptiveshout out! LOL), to Mz. Holly of Missouri River Soap for introducing me to glitter! She is an inspiration! Glitter it is so much fun and just the right touch! Need a better glitter photo for next time. Well I got into the wine for this one! Actually I use Merlot to make tomato sauce and had only 1 cup to use. So I used what I had on hand. 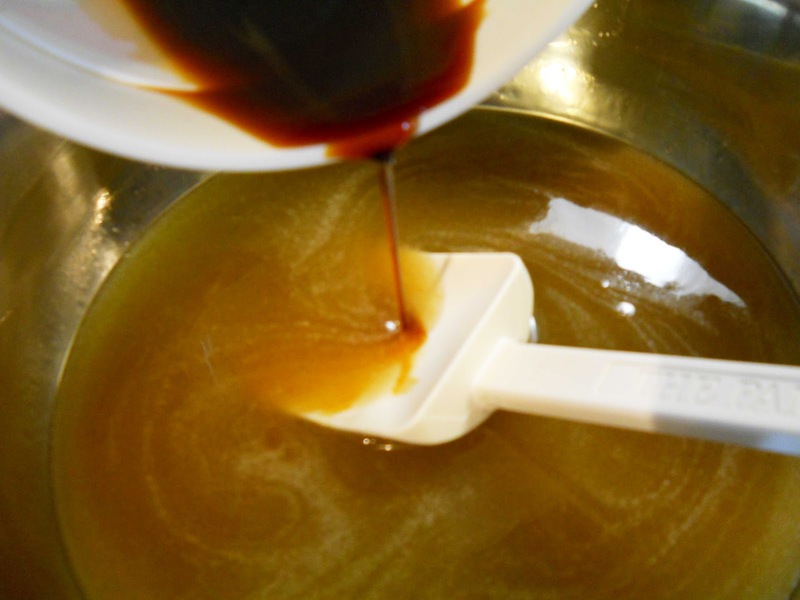 It is amazing to me 1 cup of Merlot can be reduced in a sauce pan to 1/4 cup of wine syrup. As I was only making a small batch for decoration it was the perfect amount. Added a touch of water and soaped away. Once again thanks so much to Amy of GreatCakesSoap Works for her nudge and helping hands. 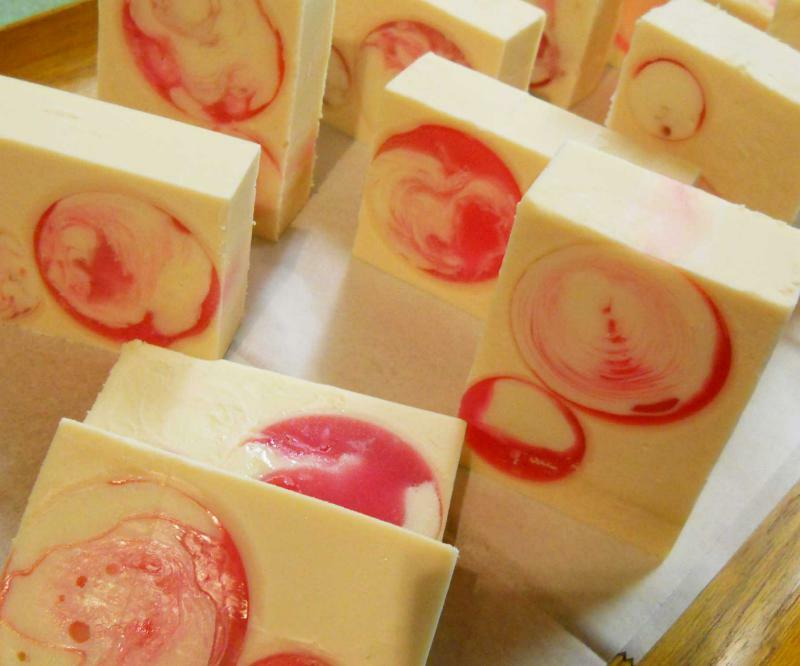 She has brought together a group and stirred the pot of imagination for many experience and learning soapmakers! You can find her blog posts here. So this is how Merlot Cheese Cake worked for me. You can tell I'm still working on Week 3 piping challenge my wedding cake shaped soap wasn't ready for the week 3 piping challenge. So I thought I'd incorporate the two challenges together..Week 3 with Week 4 added on top. Much fun. Adding Merlot Wind syrup and lye solution into the oils. I did add a touch of white after this was incorporated and a touch of clay too. Well a bit of green was needed for this project and the soap color turned out better than expected! 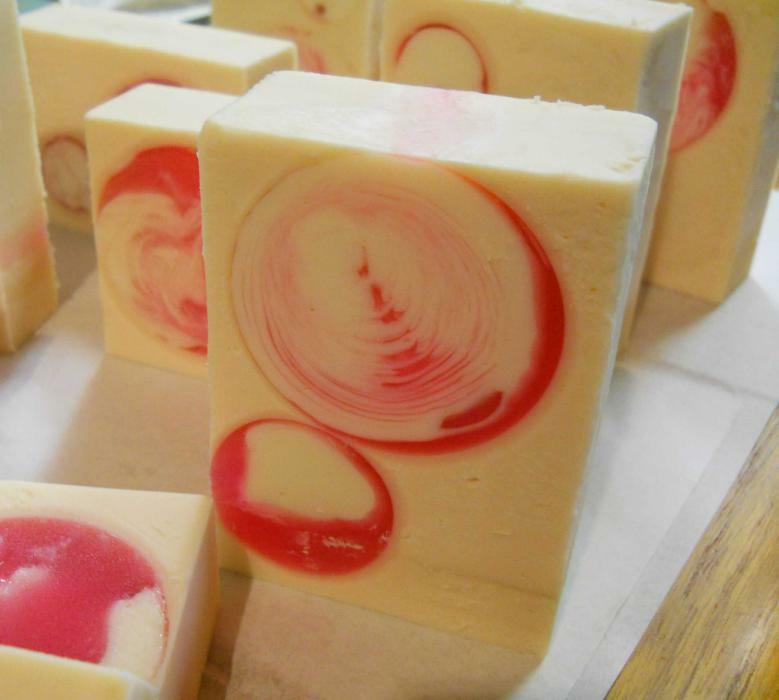 The majority of the soap has a small amount of TD and the color the Merlot left in the soap. 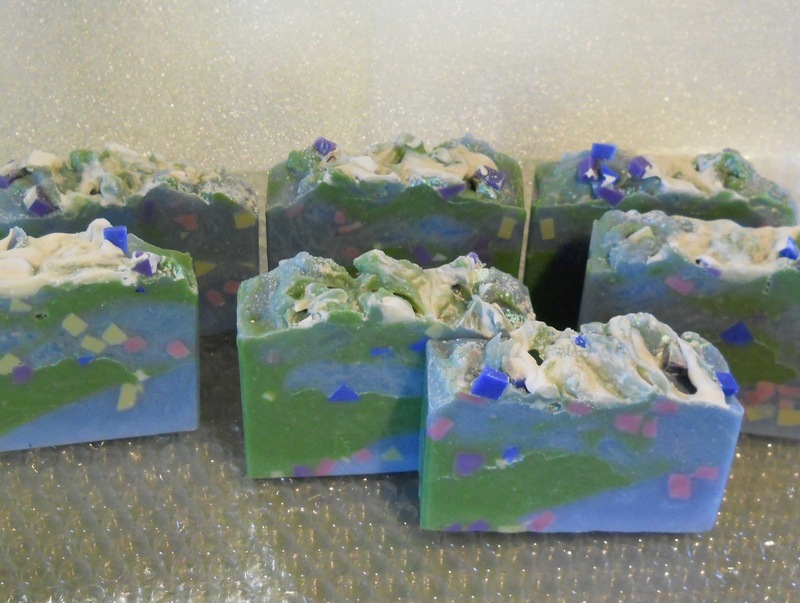 And here we go a Merlot Wine Guest Soaps! Merlot Frosted Cheese Cake this was such a fun cake to do. Yes my first cake attempt. Find the right container and I went for it. In this case this is a Healthy Choice dinner bowl from a former bachelors favorite frozen food isle! Rice and veggies medley! Something my Gene picked up at Costco when he was out shopping on his own! I'm happy it wasn't a case of sardines. 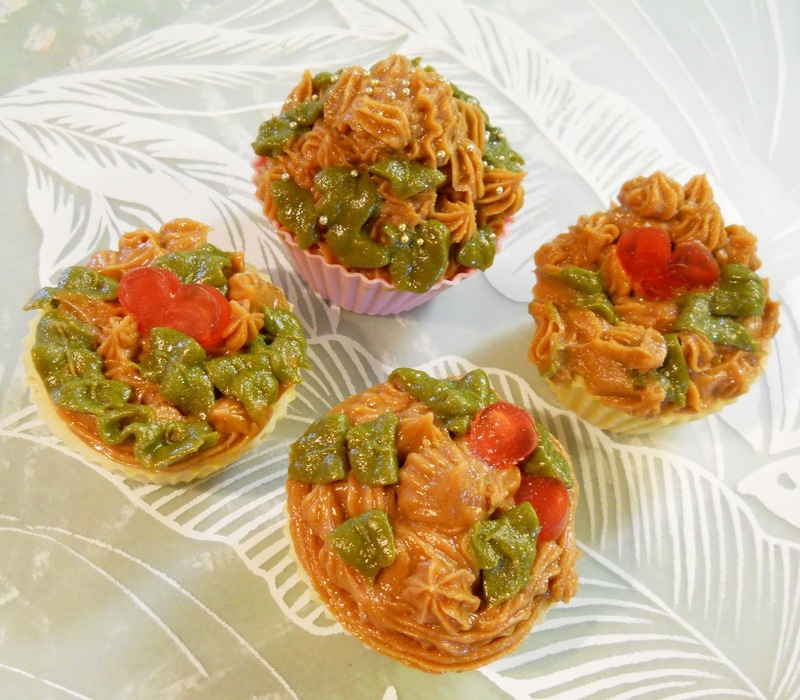 Last but not least is Merlot Frosted Cup Cakes. I'm really enjoying the piping and have learned more the second time around! Amy thank you so much! Well this is the third week of Amy Warden's GreatCakesSoapWorks Challenge and what a challenge it was! I actually started out with my first attempt being the most successful. Finding the right texture for the soap to be frosted is a determining factor on all the piping! LOL I used vetiver with lavender. 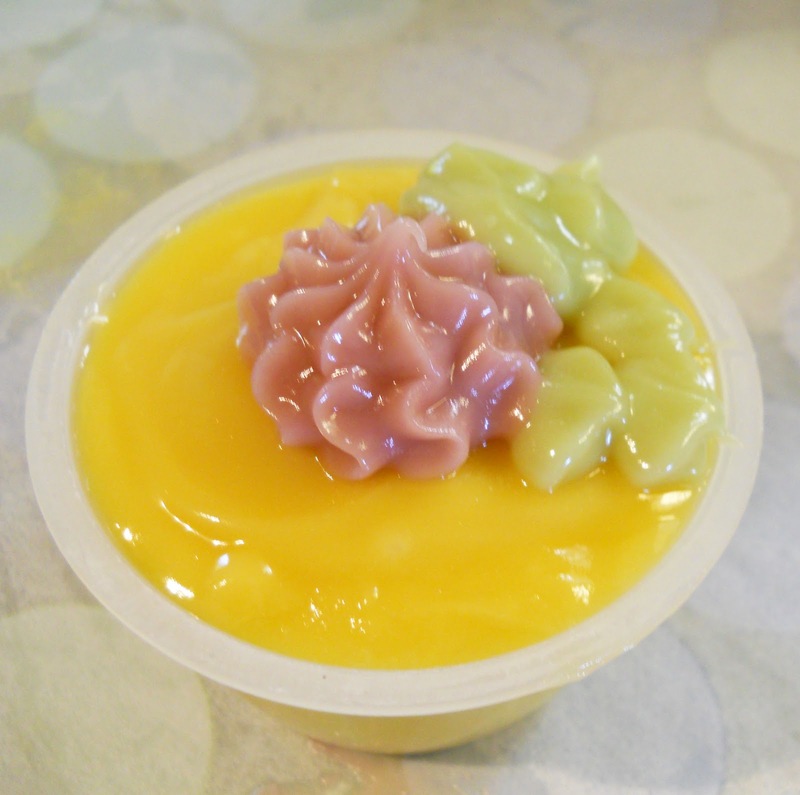 My second try is very pretty and smells beautifully and well the colors faded and the texture of the piping wasn't the best. Did I mention that it smells wonderfully! Lemon Sugar! My third attempt is current and not complete. Well you see I actually took the time to design a soap make embeds and such. measuring how much soap for each layer of a cake! Well oops, the top of the cake is the first poured and well it is at the bottom of the mold, ala wedding cake style! So it needed to set up and cure before it could come out of the mold and well be frosted! The best laid plans. New discovery, I am more of an organic type soaper, not great at fussy! My youtube with only two videos. I promise to make one soon. I need a filmer!